Storage and baseball don’t generally have much in common except when a storage company just happens to be named . . . the Official Storage Company of the San Diego Padres. We could not be more excited to be a part of a San Diego tradition and institution like the San Diego Padres. This season, as you attend San Diego Padres home games at Petco Park, be sure to be on the lookout for our banners rotating around the stadium. A few days back with the Padres playing the visiting rival Los Angeles Dodgers, we were all “entertained” by a brawl that broke out between the two clubs. It received national television coverage over and over. While the brawl may have been big news, the bigger news in our offices was the banner being displayed across the right field wall during the brawl. There we were drinking our morning coffee and reading the paper about the brawl that broke out during the Padres/Dodgers game and footage from the fight starts playing on ESPN. And then - BIGBOX.COM all over right field (see above). 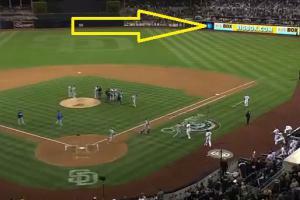 While the brawl may have been a a black eye for the Padres and San Diego, no pun intended, we love the national TV exposure. So okay, normally in our blog we talk about how you the customer can save money on San Diego storage and so far we have been talking all about us. That changes right now! We have two ways to save you money this week. You can go online and check out our website www.bigbox.com (like in the picture above) and place an order for storage and receive $25 off your total when you mention you found us online OR you can give us a call at 1-800-391-4890 and mention you saw our website online. It’s that simple. Hopefully by this time next week the Padres won’t still be in a 2-9 hole and back to there winning ways. And if you see our banner at Petco, take a picture and send it to us. We’ll post it on Facebook and give you credit. Just send us the photo to customerservice@bigbox.com.